At our house, we LOVE Autumn! Bulky sweaters, brisk days, and the sound of leaves crunching under our feet as we walk. Of course, me being a foodie and all, I love all of the yummy fall flavors! I'm sure most of you have been hitting your neighborhood coffee shops for your fall drink fix, but I'm not a coffee drinker. When Joe brought home some pumpkin pie flavored yogurt the other day, I knew I just had to turn that into a smoothie! The result? This creamy smoothie is perfect for breakfast or lunch or even as an alternative to pumpkin pie for dessert! Combine ingredients in blender pitcher and blend until smooth and creamy. Garnish with crushed ginger snap cookies. 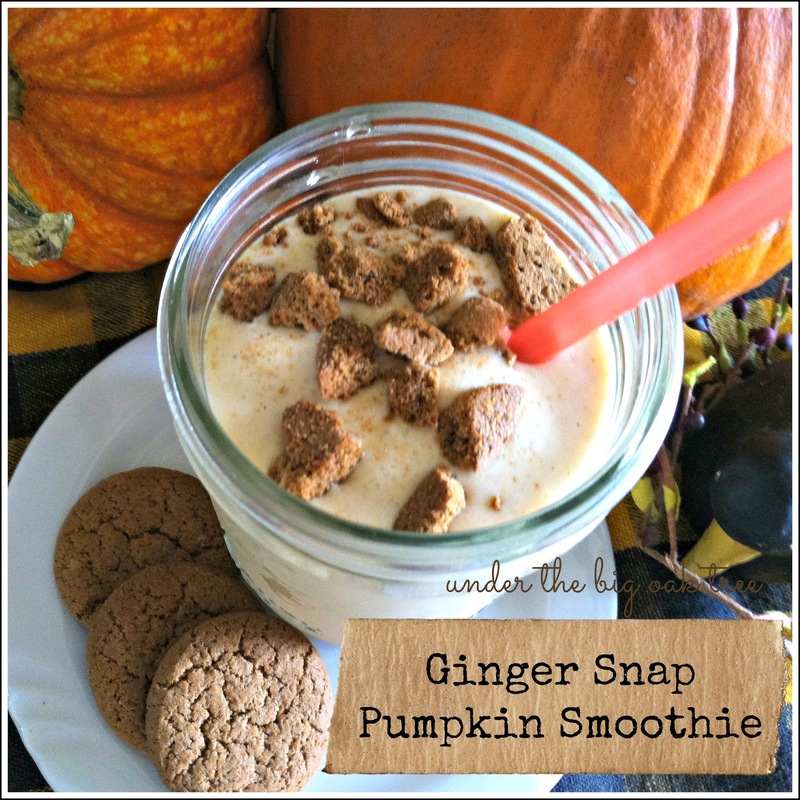 I crushed about five smaller sized ginger snaps before making my smoothie. I still had some crushed cookies left after preparing my smoothie. I crushed the cookies using the same method that I used when I crushed the Whoppers Candy for my Whopper of a Smoothie! Alternately, you could probably just toss the whole cookies into the blender with the other ingredients. I made this smoothie for myself for breakfast over the weekend and LOVED it! I was having a difficult time concentrating on taking photos of the finished product because I really just wanted to devour it right away! While I sipped this for breakfast, I realized that if I had this instead of pie for dessert, I'd be totally satisfied and not feel as if I was depriving myself of dessert! In fact, I'd even splurge and allow myself a dollop of whipped cream on a special occasion!